As I have said time and time again, theater is a team sport, and especially community theater. Every part of the machine has to work together to bring a play to life, and as Hamlet says, “The play is the thing…” Two of the most important pieces of the puzzle when doing theater are the roles of an audience and a community. This month, the Playhouse is focusing even more on development of those crucial elements of our team. 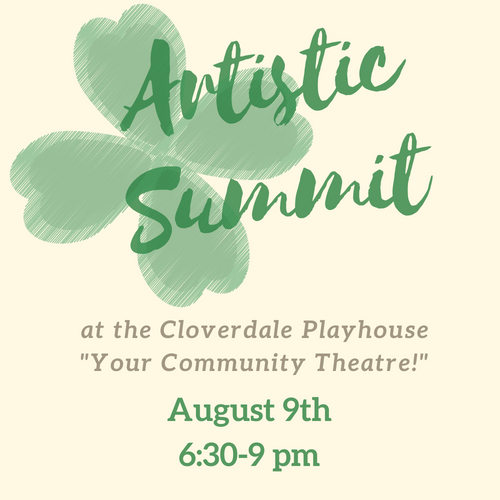 We will be hosting our first Artistic Summit designed to bring our community together for conversation and connection. On Thursday, August 9th at 6:30, join us in the Elizabeth Crump Theatre for a dialogue guided by Meg Lewis of the Montgomery Chamber of Commerce. We want to hear from you! Our goal is to get feedback about the work we are doing, what the community would like to see us doing, and how we can continue to serve the River Region as Montgomery’s Community Theater. As part of our community, we want your voice to be heard! Theater as an art is all-encompassing. It creates an environment of inclusion, community, and generosity of spirit. There is a diversity that is not only present but boldly celebrated. Theater is about storytelling, and everyone has a story. We build a stronger community by shedding light on those different from ourselves, by coming together for the shared experience of serving as a witness to someone else’s story. The hope is, within the time we spend together, there will be transformation. The Playhouse is very excited to be bringing one such unique and transformative story to our stage at the end of August. Sherry Jo Ward, an accomplished actress we met during her time at the Alabama Shakespeare Festival, was suddenly and inexplicably struck with symptoms that led to a diagnosis of an incredibly rare disease called “Stiff Person Syndrome” which affects approximately one person in a million. And just like that, her whole life changed. With great humor, perseverance, strength, and courage, Sherry has turned her fight into art, writing and performing her own one-woman show about her struggle with SPS, entitled Stiff. Touring this past year, this award-winning production has captured the hearts and minds (and funny bones) of audiences across the country. We are thrilled to bring her story to our stage for a limited run on August 24-25. Come hear her story! There are also other opportunities to visit us in August, with our monthly Rep Class on August 6 and our Joe Thomas Jr Guitar Pull on August 21. There is something for everyone! Whatever strikes your fancy, we encourage you to spend some time with us, get to know more people in the community, and add your voice to our story.